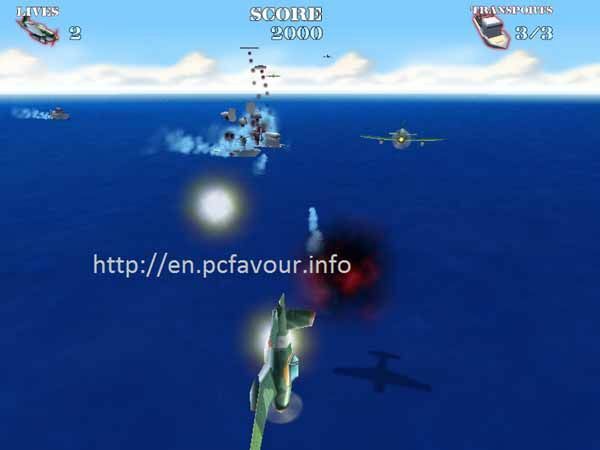 Free download Naval Strike game for your PC. If you are searching for a naval game then Naval Strike is the best game for you. Naval Strike game is very light weight and easy to play. You have to control a jet fighter to destroy the opponent jets and escape from their attack. Your mission in Naval Strike is to destroy the Naval Battleships. You can see your goal to destroy the number of ship at the top right corner of the screen. When you achieve the goal, destroy all required ship, you proceed to the next level. The game control is totally depending on mouse. The movement of mouse will move your jet while mouse clicks are used to fire. Right click is used to attack on other jets. You do not need to click again and again, you can stay your finger on the right click button along with moving your jet to escape from attack. Destroy a ship is very tough target for you at start. To destroy a Battleship, you have to make a left click to fire anti-ship missile. Your aircraft has the ability of air-to-air and air-to-sea attack. You have to stop all battleships to move forward. Make a missile fire with a distance from ship to the right. This may be hit the ship. Although at the start, you will lose a lot of missiles but do not need to worry about that. You have unlimited missiles to fire. There is also no need to worry about air-to-air ammunition. So do not get back your finger from right click button. At first level of Naval Strike, you have to destroy the three packs of single ship at first level. When you will move to 2nd level, each pack will increase with number of ship.